Huawei has gotten us all glued to the internet. The Chinese multinational tech giant has finally given us all a glimpse of its new SoC, along with some light specifications about its flagship devices, Mate 10 and Mate 10 Pro. Oh, and even though you all know about it, the smartphones would be launched on October 16th in Munich. 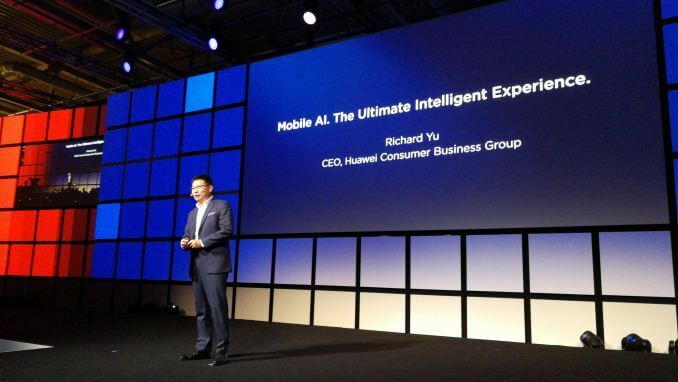 Rumors about Huawei working on a SoC that would feature a CPU, GPU and AI were being circulated for quite some time, and today all those rumors were put to rest when Huawei unveiled the Kirin 970 chip at the ongoing IFA show in Berlin. 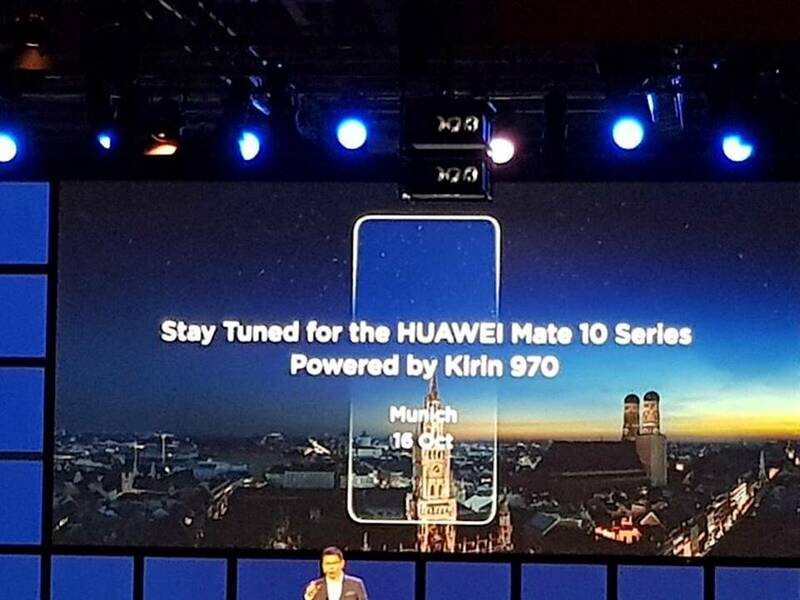 Huawei’s upcoming devices, the Mate 10 and Mate 10 Pro, would even feature the new Kirin 970 SoC onboard. Talking about the devices first, Huawei’s consumer business group CEO Richard Yu, said that both the phones would be bezel-less, and would be the first Huawei devices to feature a full screen display, a trend that has been followed by quite a lot of manufacturers this year. Huawei teased the Mate 10/Mate 10 Pro in a tweet in August, which showed that both the phones would come with a dual-camera setup, and would feature something that would be “beyondthegalaxy”. A little take on Samsung’s Galaxy series maybe? As the name suggests, the Mate 10 Pro would to be a more powerful variant of the Mate 10, and is expected to have more RAM and internal storage space than the latter, along with some other spec-upgradations. But Huawei’s main demonstration was not about the Mate 10 or the Mate 10 Pro, rather it was about its new chipset, Kirin 970. According to Yu, the 970 is “world’s first mobile device with a Neural Processing Unit” and “world’s fastest mobile modem.” Kirin 970 brings onboard a NPU (Neural Processing Unit), which makes it the first chip to have AI on the chip. 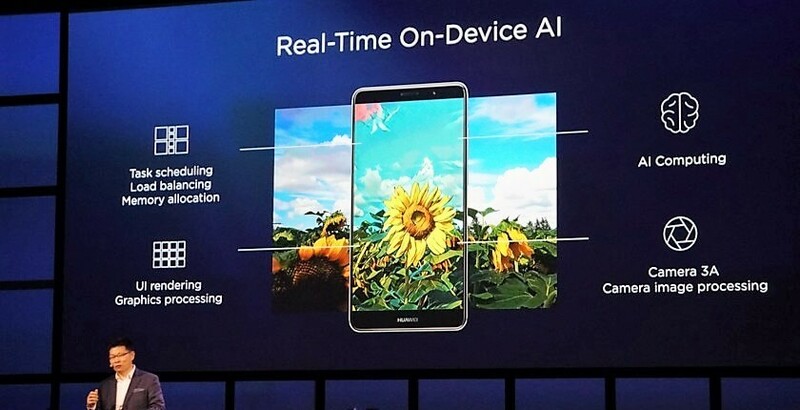 While most phones connect to the cloud in order to interact with the AI, Huawei’s upcoming devices would be different in the sense that Kirin 970 would eradicate the cloud based latency due to the presence of a dedicated AI on the chip. What difference would it make? Yu had a set of photos to explain that. Two shots were shown side by side, one taken by the Samsung Galaxy S8 and the other taken by Mate 10. 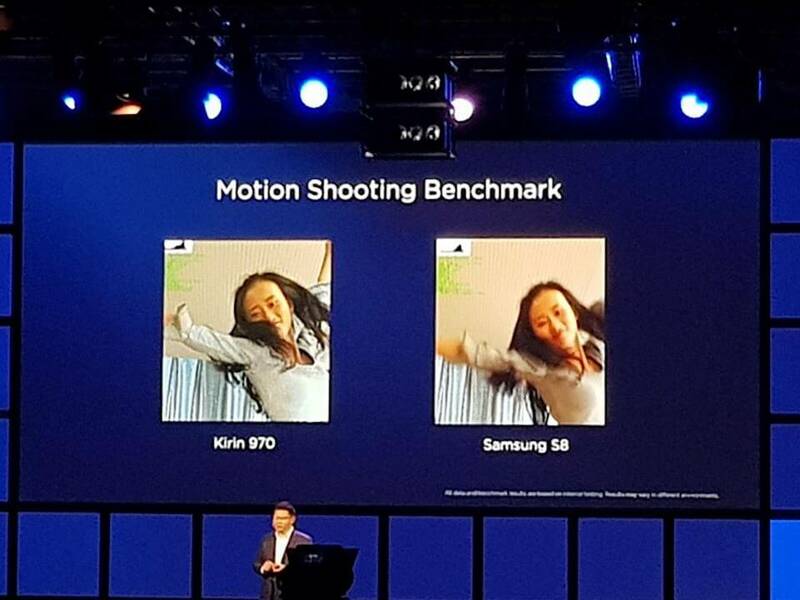 The point was to show how the Kirin 970’s NPU allowed the camera to take superior photos, and because it had two ISP (image signal processor), it could process image, data, light information faster. The result? A sharp photo by the Mate 10, as compared to the rather hazy one by the S8 (yes, you read that right). Now onto the nitty-gritty specifications of Kirin 970. The octa-core chip is built on a 10nm manufacturing process, with 5.5 billion transistors (which is about 2.5 billion more than SD835). On the Mate 10, you can expect significantly better camera performance because, according to Yu, the device is smart enough to analyze data in real time. Also Read: Dear Android OEMs, is a “notch” really that necessary? “It can tell the difference between a cat or a flower when you’re trying to take photos, and the ISPs will adjust accordingly,” Yu said. Along with that, Huawei’s new chipset also features the first ARM Mali-G72 GPU, and can support 4G data on both sims at the same time. The Kirin 970 is also expected to have a better battery life, as it is suppposedly “50 times” more efficent than a standard CPU. I guess it would be safe to say that Huawei has got all our attention.